U.S. military veterans will now be recognized on Pennsylvania drivers’ licenses. Veterans will now have the opportunity to honor their military service on their driver’s license, according to the governor’s office. Surrounded by veterans and members of the Pennsylvania National Guard, Gov. Tom Corbett kicked off the new Veterans designation initiative for Pennsylvania driver’s licenses and identification cards on Tuesday, March 4, a news release said. An American flag with the word “Veteran” beneath it will appear on the front of the license or identification card of qualified applicants. 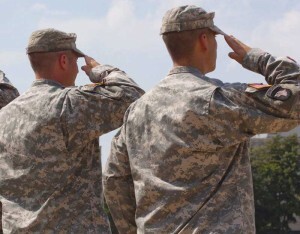 Those eligible for a Veterans Designation include those who have received a certificate of release or discharge from active duty/DD214 or equivalent, for service in the U. S. Armed Forces, including a reserve component, or the National Guard who were discharged or released from such service under conditions other than dishonorable, the release said. The Veterans Designation will incur no additional cost; however, regular renewal or duplicate fees still apply. Forms for driver’s license or ID renewals and duplicates now have a box for applicants to certify that they are a veteran, and to have the designation added. Once the Veterans Designation has been added to a driver’s license or identification card, it will automatically appear each time the card is renewed. Veterans holding a non-commercial driver’s license or identification card can immediately apply for the designation by visiting www.dmv.state.pa.us and clicking on the American Flag/Veterans Designation icon. To renew a commercial driver’s license (CDL) and add the Veterans Designation, applicants must complete and mail in a DL-143CD form and applicable fees. To obtain a duplicate CDL with the Veterans Designation, applicants must complete and mail in a DL-80CD form and applicable fees.